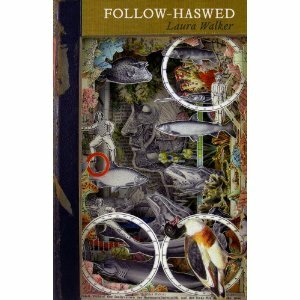 These are collaged poems: each poem is composed of fragments of a single entry from Volume VI of the Oxford English Dictionary, “Follow-Haswed.” The text includes etymologies, usage notes, definitions, and quotations. Titles are the entry words. Line breaks indicate a jump within the OED text. Through the conceptual element of the project, this is nearly a lyric fragment version of something Steve McCaffery might have imagined, composing stops and starts, halting space and breath. The poems in Follow-Haswed are condensed into a kind of shorthand. When properly done, constraint can highlight and contain the most unique spaces, and there are a number of sharp, empty spaces she has littered throughout, deliberate absences for a reader to possibly fill. When Robert Creeley articulated his own brevity, he maintained a certain through-line in his poems. In Follow-Haswed, Laura Walker composes a series of individual points, nearly as dots on an incomplete map that, when seen together, point their own way towards something else. The poems here articulate a loss, an emptiness and an unexplained ruin deliberately and wonderfully not spelled out in its entirety. Somehow, by themselves, the breaks become the through-line, and the poems expand into what the reader allows.